This story was updated on Tuesday, Aug. 7. For the last year and a half USC has been on a roller coaster of scandals — and the ride does not appear to be over. First were the news reports of hard-core drug use by medical school Dean Carmen Puliafito. Puliafito was replaced by Rohit Varma, who was later pulled from the position after an incident of sexual harassment (and the university's settlement) surfaced. Then — in a more far-reaching scandal — hundreds of women came forward alleging that campus gynecologist George Tyndall carried out improper pelvic exams and made inappropriate sexual remarks during appointments. Despite complaints to administrators, all three men kept their jobs. 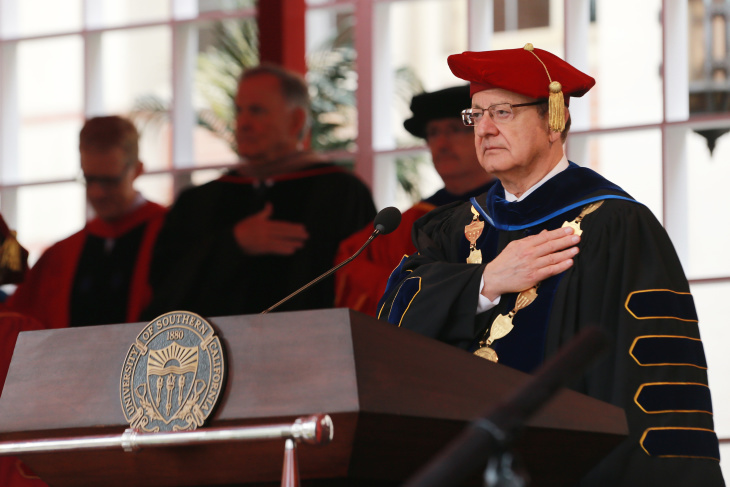 They accused USC President C. L. Max Nikias of overseeing a campus administration that swept problems under the rug and publicly demanded his resignation. Three days later, he said he would. That was May. By the end of July, he had still not stepped down. In response, nearly 700 faculty wrote a letter saying the circumstances had created a "state of turmoil and uncertainty" on the campus. On Tuesday, Nikias appeared finally to relent. A letter from USC Board of Trustees Chair Rick Caruso indicated that Nikias would resign immediately. Caruso said he wants "ambitious, aggressive" change and that board member Wanda Austin, a former CEO of The Aerospace Corporation, would replace Nikias as interim president. In a letter to the university community, Caruso noted that Austin had a record as a strong advocate for women and minorities as well as "significant executive leadership" experience. Below is a copy of the memo, followed by a summary of the lawsuits, the investigations, and who's involved. In July, the California Medical Board yanked Puliafito's medical license after it disagreed with Puliafito's lawyer that he should be allowed to continue to work as an ophthalmologist. Puliafito's lawyer said counseling had helped his client recover. In July 2017, Nikias said that the venerable L.A. law firm Gibson, Dunn, and Crutcher would investigate and issue a report about the allegations against Puliafito. The firm's lawyer Deborah Yang is taking the lead. She has defended the university in several lawsuits in recent years. The law firm's report has not been made public. Tyndall practiced as gynecologist at USC for nearly three decades. Officials said possible victims could number in the thousands and that has lawyers busy trying to find them. Alleged victims have filed three dozen lawsuits in the last few months accusing Tyndall of abuse. Celebrity lawyer Gloria Allred is representing two dozen women. A Google search for "USC, Tyndall, lawsuits" resulted in four ads at the top of the search by law firms looking to represent Tyndall's accusers. One of them promised "We Can Help You Demand Justice." USC gave Los Angeles police investigators some names of people alleging abuse by Tyndall from a telephone line the university set up. That phone line has received hundreds of calls. In May, the LAPD said it had started to interview 52 possible victims of Tyndall. Some of those people came forward to USC, some to the LAPD. Police Capt. William Hayes said that Tyndall treated about 10,000 students in his career at USC, so he expected that 52 figure to rise. In June, the U.S. Department of Education said it was opening an investigation into whether USC tried to hide from investigators sexual harassment complaints against Tyndall. And on Wednesday, USC added another scandal to the list. The L.A. Times reported that L.A. County Supervisor Mark Ridley-Thomas donated $100,000 from a political fund to USC. The money ended up in an outside organization controlled by his son, Sebastian Ridley-Thomas, who'd begun working at USC after leaving politics last year. On May 31, newly appointed Board of Trustees Chair Rick Caruso emailed the university community that the process to find a new president had begun. That seemed to mean that the current president would step down. But Caruso did not say when, and two months later, a USC spokesman would not say whether Nikias had submitted his official resignation. This angered professors and others for a few reasons. It's still unclear how much Nikias knew about Puliafito and Tyndall's wrongdoing, but activist professors say that Nikias oversaw an administration that tried to keep this kind of behavior quiet. Professors said Nikias had to go and an interim president needed to be in place to improve transparency and begin to change policies. USC's Faculty Senate is the established group that represents professors on curriculum and governance issues. Yaniv Bar-Cohen, its new president, said the scandals are a tarnish on the university's reputation that must not be allowed to happen again. But another group, Concerned Faculty of USC, has risen since May as the vocal critic of USC practices. They advocate against the danger students were put in by allowing this wrongdoing. The group's petition demanding Nikias resign was signed by 200 professors in May and seen as a watershed moment. The group's leaders said USC faculty had up until then been reticent and fearful of criticizing USC in public. Last week, the group made public a petition signed by 688 professors demanding Nikias resign "swiftly" and an interim president be appointed by August 21, the first day of classes. The group warned of protests and walkouts if Nikias remained president by that date.